Our office, housed in a big, green barn, is centrally located in Marietta. 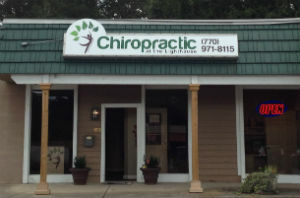 Chiropractic at the Lighthouse LLC is conveniently located in Marietta, between a Citgo and Arnold’s Automotive Repair (housed in a big green barn). Cobb County Public Library is also located nearby and Bruster’s, an ice cream parlor, is across the street. There is plenty of free parking available in the parking lot.